We have been given the above title and asked to choose an item which we take apart and put back together again in order to understand how it has been made. So I picked a shirt...... Silly girl! Anyway the challenge is there and I am rising to it! After visiting 7 charity shops I found a 100% cotton shirt as I want to print on it. Without realising the amount of work that goes into shirt making it has taken quite a long time to unpick, obviously recording the process as I went along. We will be making a pattern from our chosen item and then put it back together again. 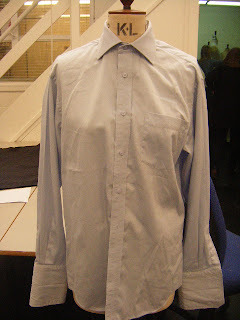 I hope to change it by adding extra fabric and pockets following my subject "Shreds of Evidence - Print & its machinery" so I am writing it now as proof that something will happen to change the appearance of said shirt here - it may take some time. Did quite a lot of mark making, looking at meadows whilst visiting Harlow Carr gardens. Diverted off course a little, so back to looking at the growth of Blodeuwedd this week. I layered some flower petals with sheer fabric over the top and ironed bondawebb to the back to hold in place. I then stitched over, adding paper to the piece and used Koh-i-noor dyes. The photograph shows the piece hanging in my window. Progressing further I will shortly be attending some life drawing classes at college, arranged by my tutor Hannah Lamb. A little scary - so will post when this happens. In the meantime will continue with stitching on paper and printing with this. Well its always a strange week the first one back. Briefs are handed out and it all seems very daunting, I think the key is to be as organised as possible - so I live in hope. Crits were yesterday which we submitted mood boards for our summer project. My three subjects are "Blodeuwedd - The Mythical Flower Bride" who was made from oak and meadowsweet blossom (lots of chanting went on! ), Shreds of Evidence I - Distressed Surfaces of an Old Textile Mill and Shreds of Evidence II - Print and its Machinery. I wanted my ideas to be conceptual and to investigate a story to tell and hopefully to interpret in my own way. 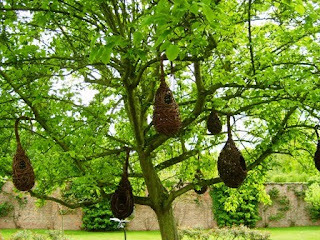 The photograph above is of Woven birds' nests sculptures by Jessica Travers at Newby Hall, Ripon. They are really beautiful and Jessica uses natural and recycled materials. Newby Hall does have alot of sculptures to see within the gardens and is well worth a visit www.newbyhall.co.uk. Its a wonderful windy day so need to clear my head and get blown about outside - plus there are a lot of leaves to collect out there! 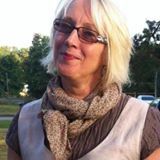 I have had the opportunity to spend a few days with Dionne Swift ( www.dionneswift.co.uk) at her studio in Huddersfield. Today she was printing using a Steam Roller - which you can view on her facebook page tomorrow. She made a print plate for a huge collographic print 8 x 4 ft, messy but fun - see how the story unfolds. Its good experience to help out an established designer in their studio and to see just what hard work it is working for yourself. I am back on Friday helping Dionne prepare for HOST ( www.hoststudios.co.uk). Have really enjoyed my time with her. This is the linen that nails were pushed through then left in a tray to get wet / weather under a tree. Really pleased with the results. I particularly like the dark areas where the nails were pushed through. The experiment with the paper didn't really weather at all, having re-buried it after the chicken fiasco! Went to visit an old dis-used textile mill which has been empty for over 10 years, couldn't get inside but managed to take lots of photographs of the outside and its distressed state. Still lots of work to do on this subject matter!